Our second week in Australia was in Queensland. I’ve already mentioned the diving and snorkeling here. After returning from the reef, we rented a car and headed north. The far northeast part of Queensland is the Daintree Rainforest. It’s a national park, and also has several other world designations. You may never have heard of this place, but it’s the oldest rainforest in the world, several times older than the Amazon. So a lot of the native plants and animals here date way back. We rented a car in Cairns, taught ourselves to drive on the left, and first drove to the Mossman Gorge. 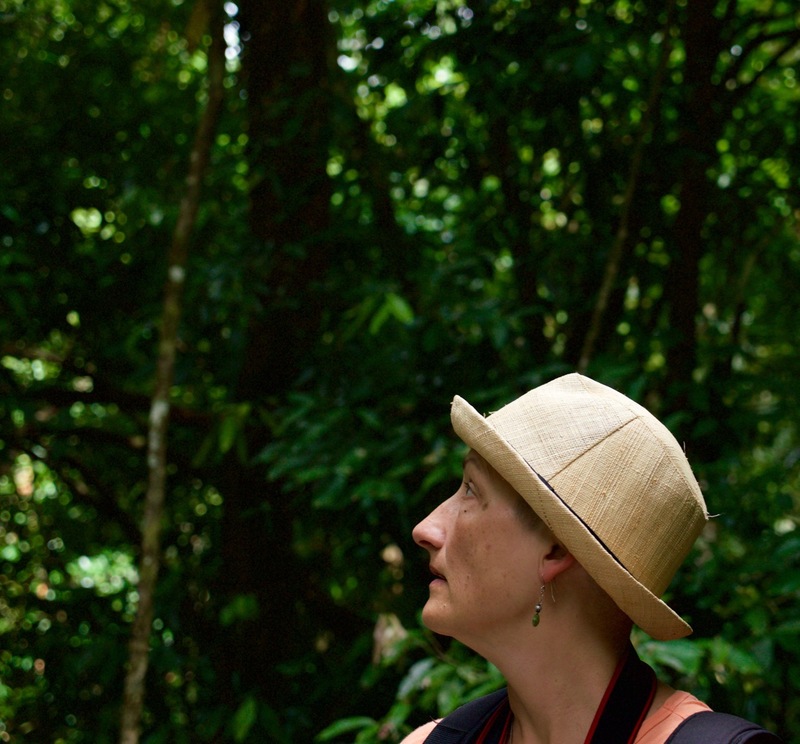 There we went on a nature hike where we saw lots of the plants and animals of Daintree. The B&B we stayed in at the rainforest was pretty amazing. It’s almost totally off the grid, a building that gathers rainwater and generates electricity from solar power. Each morning, for breakfast we’d get a huge plate of eight to ten different locally-grown fruits. That included familiar things like bananas, pineapples, and guava, but also endemic fruits like different varieties of sapote. One day we went on another nature walk. This one was called the Daintree Discovery Centre. 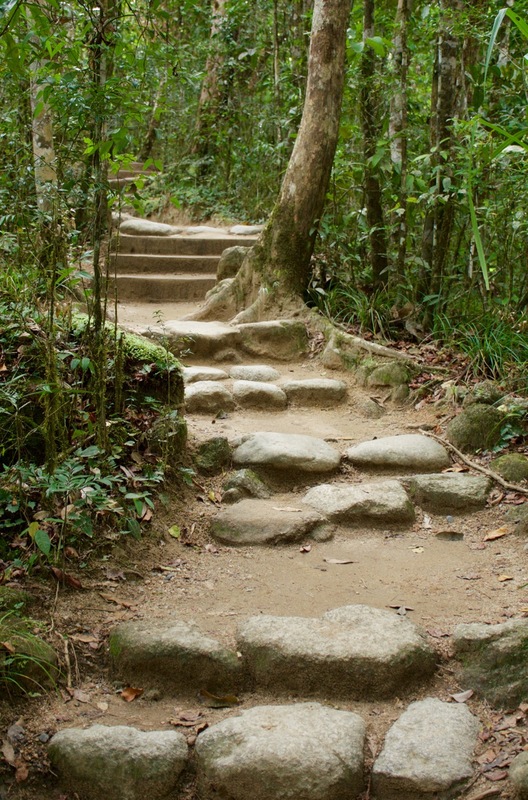 It was much flashier and more accessible than the Mossman Gorge walk, with a lot more information — too much, in fact, when you consider the audio guide, the printed booklet, and the signs they had everywhere. Frankly it was a bit of a waste of money since it had all the same things as Mossman. The highlight was this tall tower they built that goes above the rainforest canopy. From the top you can look out among the highest branches, giving you a special view of the birds. That evening we went on a guided sunset nature cruise on the Daintree River itself. Our guide was this old guy who moved to Australia from Oklahoma decades ago. He’s got a boat and knows a lot about the flora and fauna of the area. We saw lots of birds, a few crocodiles, and over a million bats of three different species. 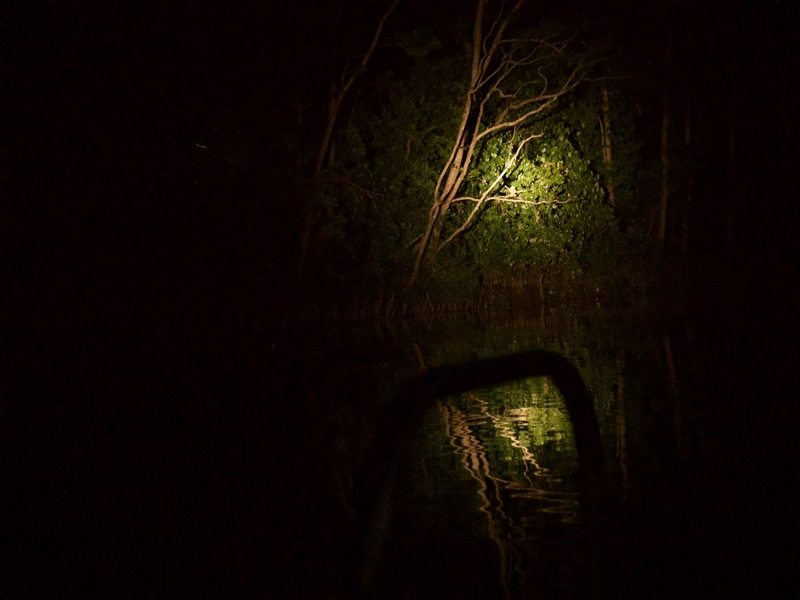 Once it was dark, the guide got out his big battery powered flashlight to help point out nocturnal animals. The next day was our last in the area, so we finished with a trip to Cow Bay Beach. 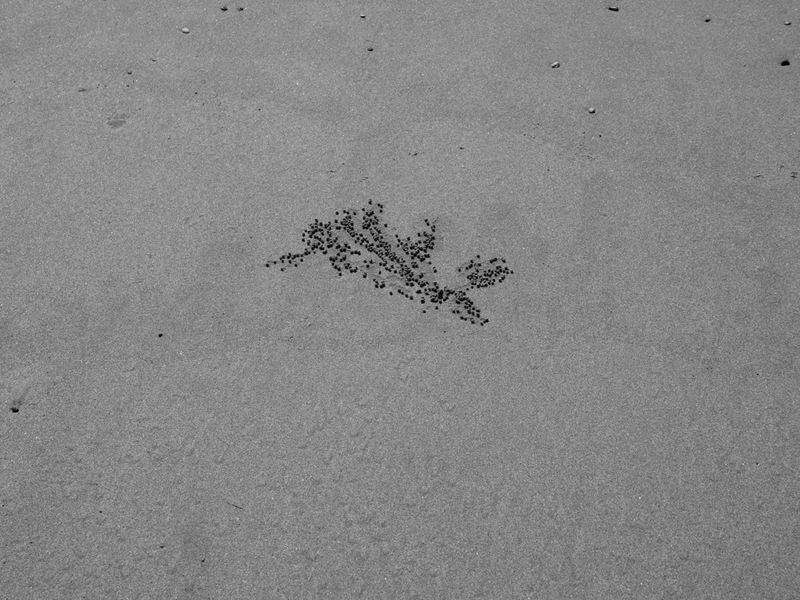 Our host at the B&B had told us about the areas on the sand where tiny crabs come up and poop out balls of sand in weird and — to him, at least — artistic patterns. The idea is that these look a little like some of the abstract Aborigine art. 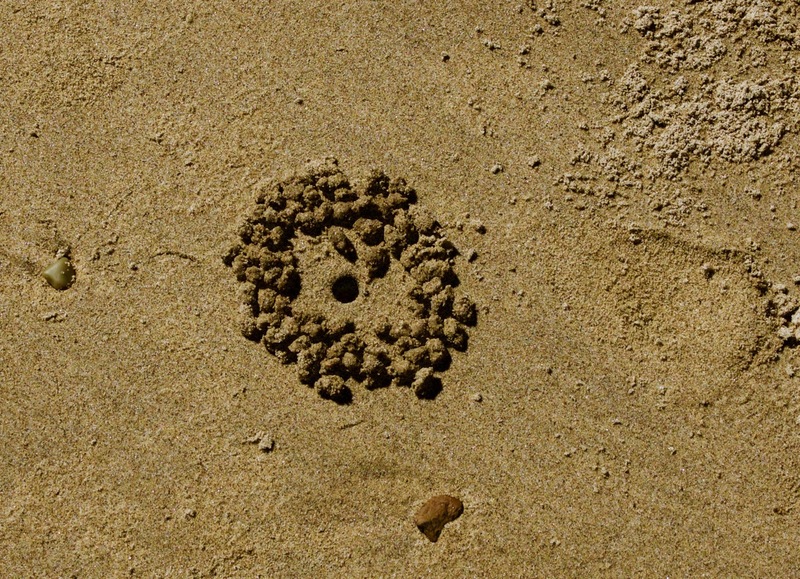 He’s got an idea for a photo series of these, with “frames” marked in the sand. Once we got to the beach we soon found what he was talking about. So I snapped a few photos to see how they look. What do you think? Would you buy this to put on your wall at home? While Beth was taking photos on the beach, I sought out some shade in the trees. That’s when I surprised and was surprised by this snake. 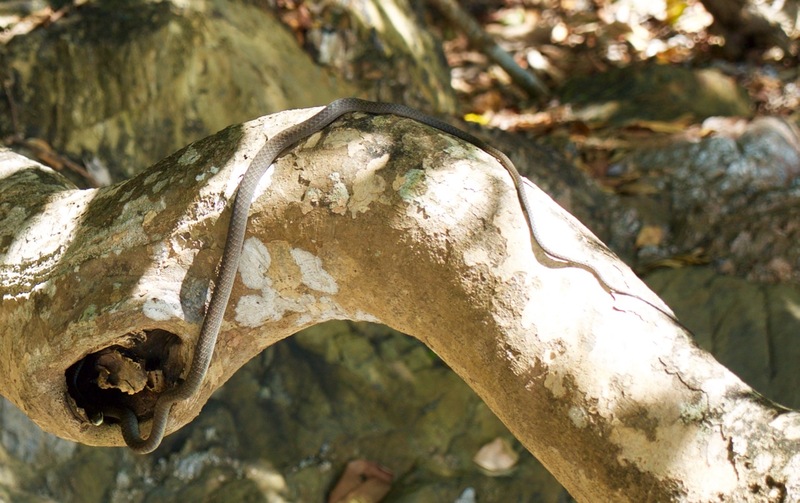 I have no idea what kind of snake it is, but considering it’s Australia I’m sure it would kill me in an instant if it bit me. Gave me a right shock, she did! I almost sat on her. The area behind part of Cow Bay Beach was fenced off like this. Apparently this area is special to the male aborigines, so tourists are not allowed to go there. Remember how I mentioned that I did so much snorkeling my feet hurt? Well, here’s how my toes looked a week later. No wonder they hurt! I rubbed the skin off some of my toe knuckles! As I’m writing this, it’s now two weeks after the snorkeling, and I’ve still got scabs on my toes. Oh well, they’ll heal, I’m sure. And now I’ll end this post with a couple examples of junk food they don’t have at home. First is Coca-Cola Life, which is some kind of soft drink that’s sweetened with a mix of sugar (cane sugar, of course) and stevia. I never actually drank it. I bought this can, but never had a chance to try the stuff and gave it to the B&B host instead. 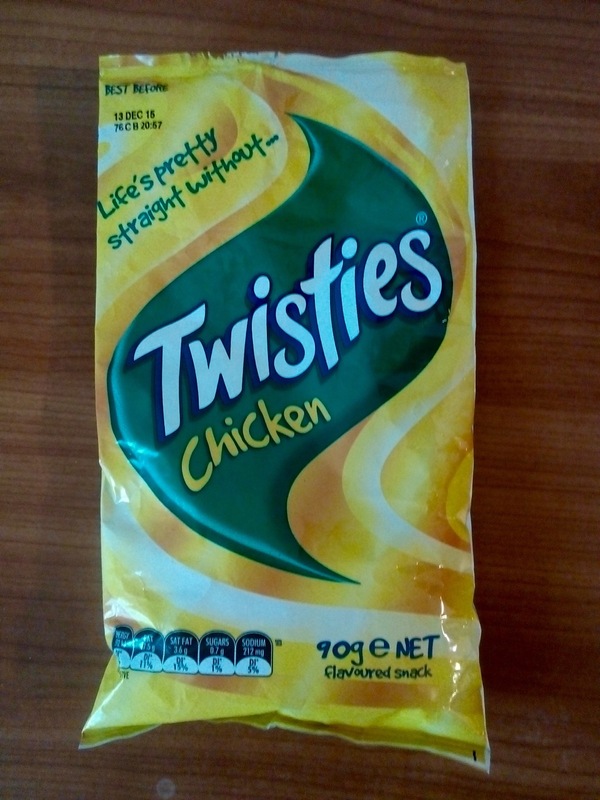 Second is Twisties Chicken. For one thing, we don’t have a snack food called Twisties in America (that I’ve ever seen). Also, I learned the Australians seem to flavor nearly everything with chicken flavor. Twisties, it turns out, are sorta like Cheetos but without the cheese. And these have chicken flavor. Whenever we’d have food that included chips (French fried potatoes) in Australia, the server would ask if we want “chicken salt” or “regular salt”. I never heard any local ever order regular salt when chicken salt was an option. Aussies just go gaga for chicken flavored salt, apparently. So I had to try it, too.